Sometimes you do big projects that take a lot of time, money and brain power. Other times you do simple things here and there that help bring a space to life. And then there are times you do something relatively small, that isn't the easiest, but is by no means the hardest and then you or in this case me, forget to ever even mention it to you guys. And with that, today I want to tell you about the niche Brent created on the side of our fireplace. It was cord city over here! 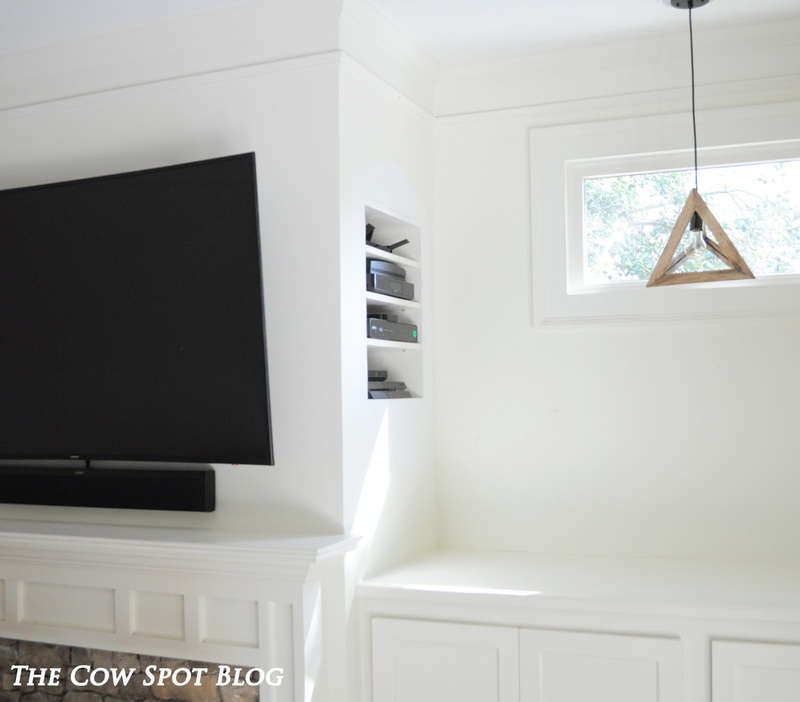 In our last house we put all of the TV "stuff" behind the fireplace which happened to be at the top of the stairs going down into our basement. However, as you can see we didn't have that option here. We had a fireplace on an exterior wall with flanking built-in cabinets that had GLASS DOORS. We knew something had to be done so Brent decided he was going to see if it was possible to create a niche on the side of the fireplace to store our goods. I'm not really sure how this project jumped to numero uno in the big scheme of our life at that time, but it did. Because it was literally moving day, family was in town helping us and before I knew it my brother-in-law Jimmy was hammering out a hole in my wall. Once they had a small hole Brent used his saw to cut out a bigger hole so they could take a look at what was going on behind the sheetrock. The hope was that there would be enough space behind the wall before the fireplace flew to insert a cabinet to hold all of our gear. Lucky for us...there was! 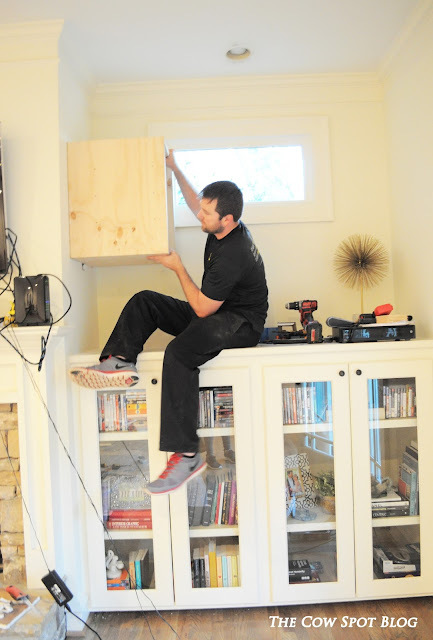 Brent wasted no time pulling out the necessary tools and whipped us up a box to slide right into the space. 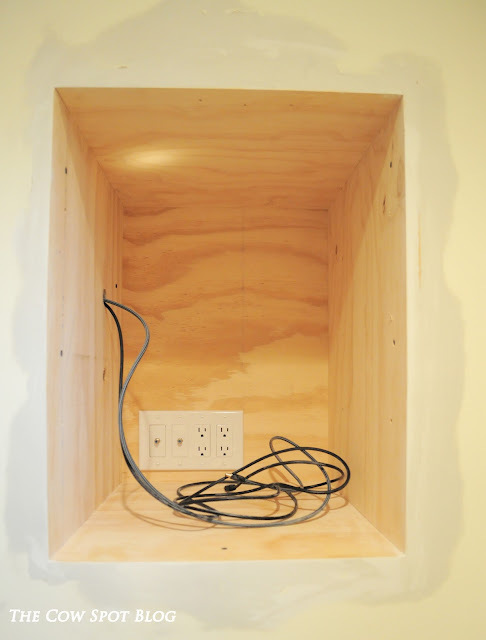 Once he had the box in the hole he pulled all of the wires through and installed a new outlet to plug everything in to. 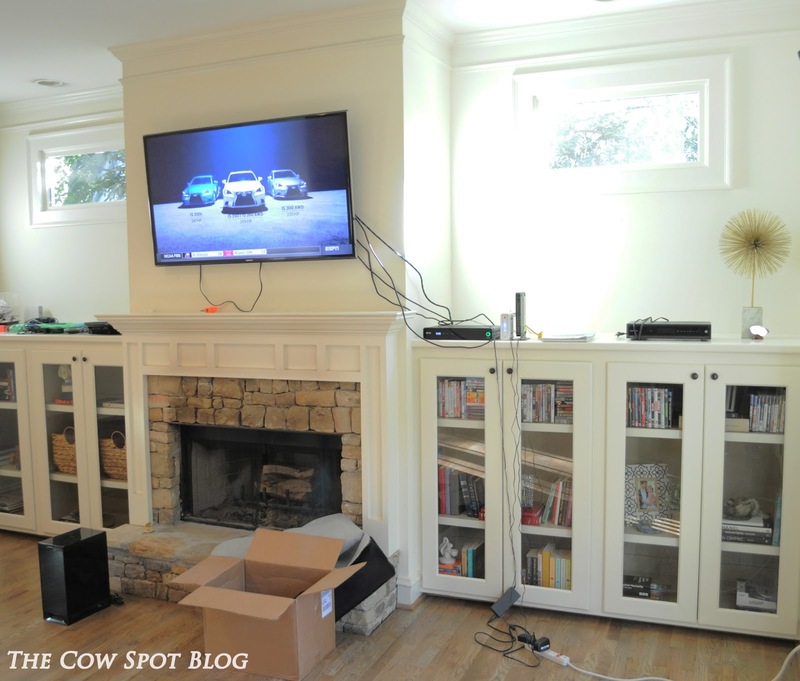 Next we installed some shelves, painted everything the same color as the walls and loaded our little niche 's with all of the TV, video game and Internet gear. It's not glamorous or groundbreaking but it made a HUGE difference in this room. You literally would never even know this niche was there unless you were entering from the back patio. 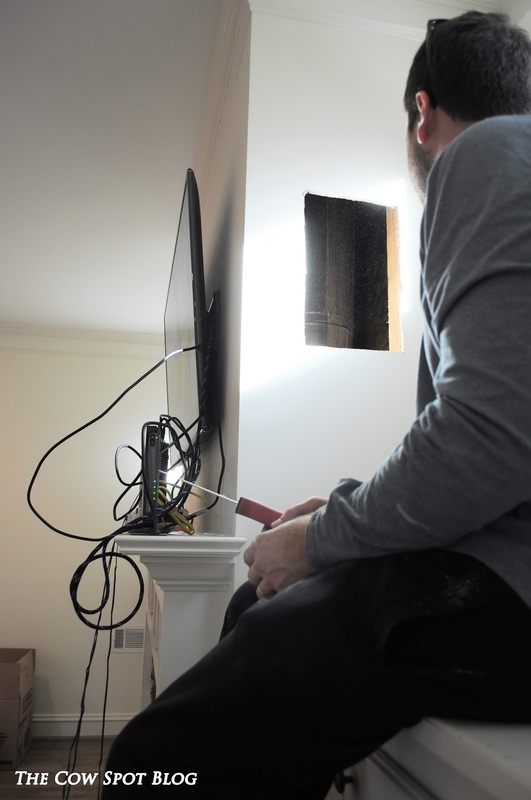 Having a TV over a fireplace is not always ideal, but having a TV over your fireplace with cords dangling every which way is just...........terrible, visually speaking. 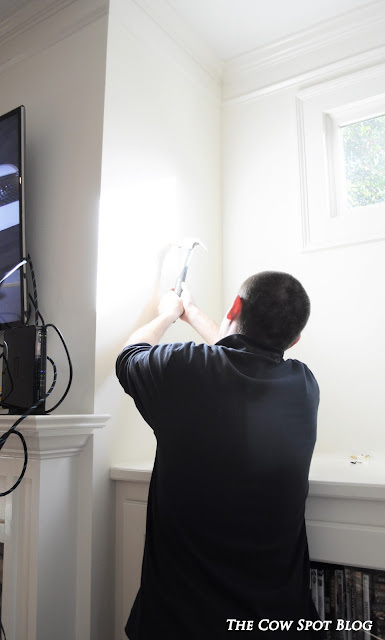 Lucky for us, this little issue was an easy DIY fix that really got this room off to a good start! That looks so sleek - what a great use of that space!